I don’t read enough non-fiction, so when I browsed School Library Journal for prospects, Linda Sue Park’s A Long Walk to Water stood out. The book follows two stories that ultimately intersect. Salva, an eleven-year-old boy living in Sudan, finds his village under attack one day while he’s in the middle of school. His teacher tells all of the students to enter the jungle to escape the gunfire of rebels from the North. Sudan, at the time, was in the midst of a bloody civil war, which recently ended with the country being divided into into two separate nations. After escaping his classroom, he follows others as they head east, away from the fighting. Many months are spent walking, and considerable time is spent in refugee camps. Salva is eventually adopted as a teen by a family in the United States. But his story is far from over with the adoption. Nya, a young girl living in a small African village is charged with endless, long walks to the water hole each day until it dries up at the end of each season; her family then moves temporarily to another village where slightly more water can be found. This is her life – a constant search for water. 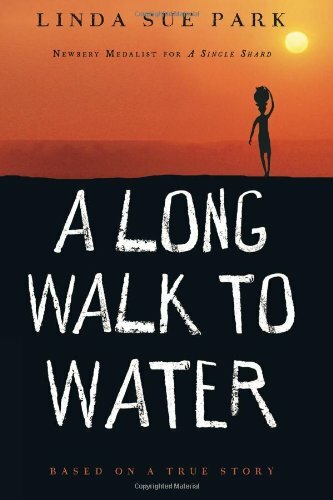 A Long Walk to Water, by Linda Sue Park, intersects these two stories in what I would consider a must read for all middle school children. Short and poignant, Salva and Nya’s stories demonstrate the inner goodness found within us all, as well as the fierce determination to overcome staggering odds.